It's been a year since the Cybeasts threatened the peace of the world. Lan and his friends think life can't be better living in a quiet, peaceful net society. Deep inside, Lan wants to relive the days of defeating net criminals, and saving lives... Soon he will get his wish, because a dark secret is about to threaten the planet. Many years ago, a beast was unleashed upon the Net. This beast was eventually defeated by none other than the duo of Lan and MegaMan. A mysterious group named "Red Infinity" wants to resurrect the beast. Its members are gathering "Z Parts" from around the world. While Lan is at Sci Lab one day, a mysterious navi attacks and steals an old document from Sci Lab's computers... What could be in this old file that Red Infinity would want? What do the "Z Parts" have to do with the beast? 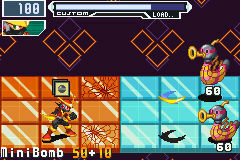 What did this navi steal from MegaMan, crippling him at the scene of the battle? 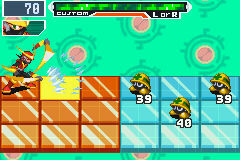 Stay tuned for more updates from MegaMan Battle Network - Chrono X to find out! The Merge n' Modify Embodiment Navi-Transform Operation. This new ability allows Megaman to harvest some of the powers and abilities of other Navis through the power of a special program! 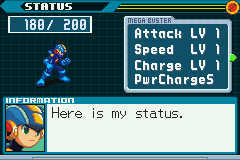 Reaching back to friends and enemies from the past and present, Megaman will grow stronger and stronger on his journey. But the past? How could that happen? And does Red Infinity have anything to do with this? Once you get a MeMENTO, you can equip it by opening the MeMENTO Menu from the Status Screen. You can only equip one MeMENTO at a time, so keep strengths and weaknesses in mind before charging into important battles. After equipping a MeMENTO, you'll notice the Mega's appearance and Stat Points have changed, along with his Charge Shot! Every MeMENTO grants special bonuses and weaknesses. Mess with them until you find one that fits you best! Choose wisely to dominate your enemies in battle. For example, Quick MeMENTO gains speed boosts, a Quick Boomerang Charge Shot, and a Quick Sheild to block attacks as he zips around the battle field at takes out enemies swiftly. This makes him ideal against a single foe, slow or fast, while battles with large numbers of powerful enemies might prove to be a challenge. 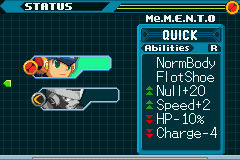 Once you unequip your current MeMENTO, Megaman's Stats, appearance, and Abilities will go back to normal. All Stat changes resulting from the Navi Customizer will be unaffected by unequiping MeMENTOS.